Volvo trucks and Volvo cars can now alert each other to traffic hazards, for instance to obstacles in the road. 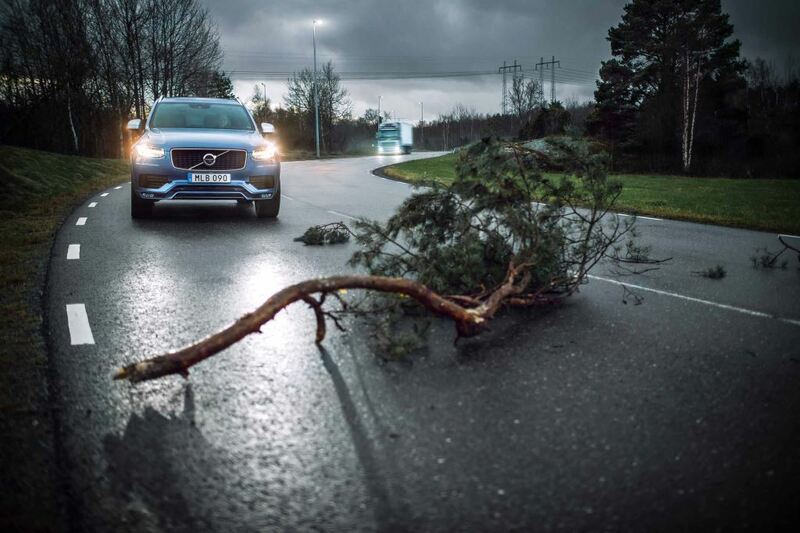 When the driver activates the vehicle’s hazard warning lights, a signal is transmitted to the Volvo Cars cloud service. From there the information is relayed to the corresponding service at Volvo Trucks. An alert is then transmitted to all trucks and cars approaching the location of the vehicle with the activated hazard warning lights. Those who stay in touch with overseas developments will be aware of the rapid move towards autonomous trucks and cars where the vehicle drives itself while the driver chills out. A lot of development has also taken place in the arena of truck platooning which allows a sort of train of trucks to follow each other, each one connected. With Connected Safety, Volvo cars and Volvo trucks with the system activated can alert each other to risky situations on the road. This is possible because Volvo Trucks and Volvo Cars now share safety-related data between their cloud services. Now we hear that Volvo Trucks is introducing a cloud-based service, Connected Safety, which allows Volvo trucks and Volvo cars to automatically alert each other to hazardous traffic situations. Thanks to pioneering collaboration, two independent vehicle manufacturers are allowing their cars and trucks to share real-time traffic hazard information. “Expanded cooperation between different players is one of the most important keys to improved road safety. If more vehicles can exchange real-time information about the traffic situation, it will lower the risk of accidents. 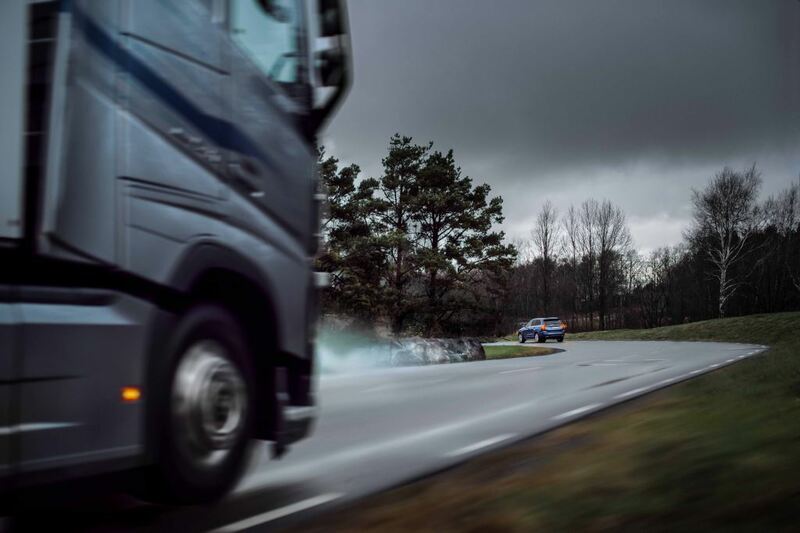 With Connected Safety, we are opening the door to the future, with the hope that more vehicle manufacturers will join in,” says Carl Johan Almqvist, Traffic and Product Safety Director at Volvo Trucks. A vehicle standing still by the roadside, for instance owing to an obstruction, risks being hit from the rear. The risk is particularly severe in poor visibility, for instance in a sharp bend. 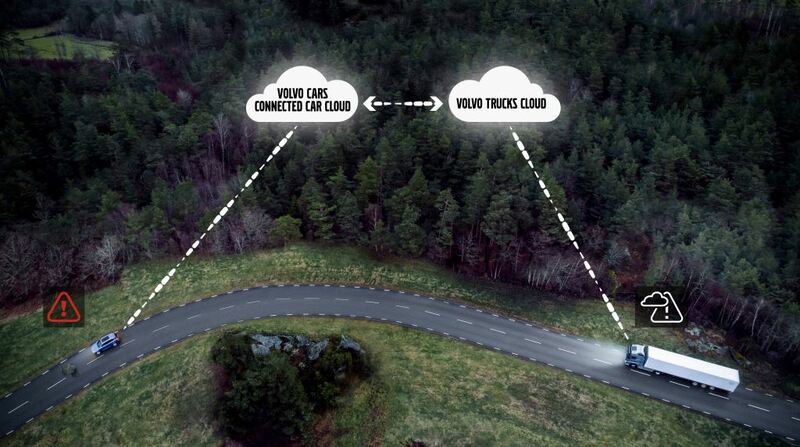 Since Volvo Trucks and Volvo Cars now share safety-related data between their respective cloud services, Volvo trucks and Volvo cars with the service activated can alert each other to traffic hazards. 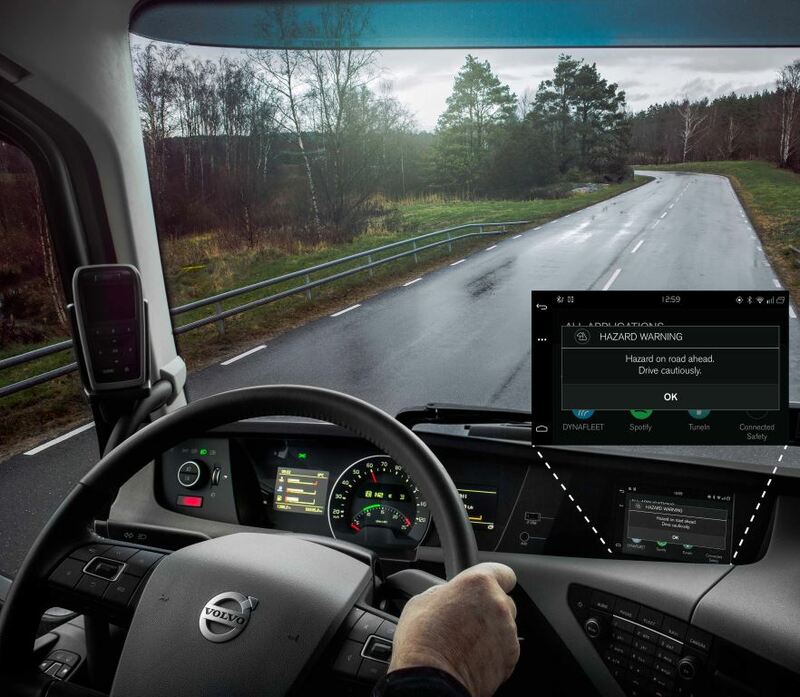 Here’s how Connected Safety works: When the hazard warning lights are switched on, the truck sends a signal via the driver’s Internet-connected mobile phone to Volvo Trucks’ cloud service. From there, the information is forwarded to the corresponding service at Volvo Cars. An alert is then transmitted to all connected cars and trucks approaching the location of the vehicle whose hazard lights have been activated. Additional accident-prevention safety systems for Volvo trucks include: Adaptive Cruise Control: active cruise control that helps the driver maintain a pre-set time gap to the vehicle in front. Collision warning with Emergency Brake: designed to alert the driver to the risk of a collision with the vehicle in front and to activate the brakes if necessary. Driver Alert Support: alerts the driver to stop for a break if the system identifies signs of inattentiveness.